Here's another example of how a wheel stop (i.e., the black & yellow strip shown at lower left of photo) can launch a vehicle up and forward — with disastrous effects. The shallow curb didn't help matters, either. 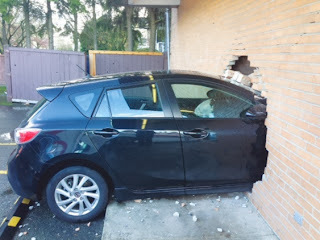 Thanks to Rob Reiter for forwarding this newslink from Richmond News in Richmond, BC, Canada: "Driver plows into parking lot wall; 7-11 store closed, staff member hospitalized after Tuesday crash" (November 12, 2013). The paper's photo caption says it all: "This driver allegedly lost control in a parking lot before getting propelled via a rubber ramp into this brick wall."